Is it True that “Just About Everyone” Eventually Pays Income Tax? Acknowledging the fact that in any one year about half the population does not pay federal income tax, Paul Krugman and the authors of a report by the Hamilton Project argue that what matters is the life cycle, i.e. how much someone pays in tax over his or her life. True, in many ways this matters, just as income over the life cycle matters. But let’s first establish the facts. The Hamilton Project report uses Census data from 2008, which indicates that nonpayers tend to be elderly or young. In contrast, only about 25 percent of middle age earners are nonpayers. However, this is not the most recent data. And something big happened in 2009: the Great Recession began and numerous low-income tax provisions were passed as part of the American Recovery and Reinvestment Act, particularly expansion of the Child Credit, the Earned Income Tax Credit, and the introduction of the Making Work Pay Credit. 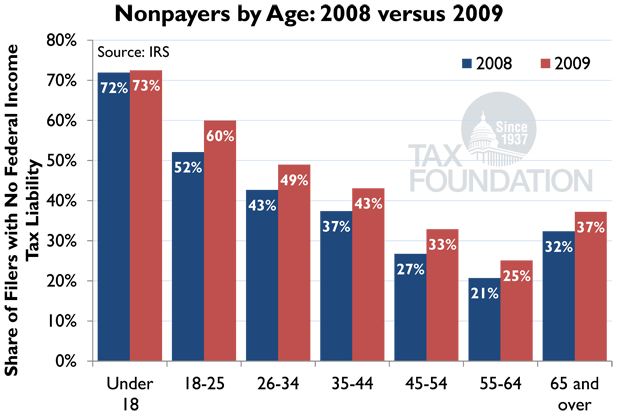 Shown below is a comparison of nonpayers by age in tax year 2008 and 2009, which is the most recent data from the IRS. This shows the percentage of filers who pay no federal income tax, so does not include the non-filers, who of course also pay no federal income tax. Given that, the 2008 IRS numbers largely agree with those presented by the Hamilton Project. The chart below indicates that the highest nonpayer percentages are among young filers, i.e. in both years a majority of those under age 26 were nonpayers. Most middle-age filers do pay federal income tax. The IRS data indicates that most elderly filers pay income tax as well, which disagrees with the data presented by the Hamiliton Project, presumably because the non-filing population is disproportionately elderly. However, between 2008 and 2009 the nonpayer percentage increased for every age group. Among those in their peak earning and taxpaying years, age 55 to 65, the percentage of filers who were nonpayers increased from 21 percent to 25 percent. The largest increase appears to be among those aged 18 to 26, where nonpayer status increased from 52 percent to 60 percent. Clearly, the Hamilton Project and Krugman have understated the prevalence of nonpayers across age groups. They have also failed to identify the growth of nonpayers in recent years – the doubling of the rate since 1990 – and the tax policy changes behind this trend. We discuss this more fully in our recent nonpayer reports and our new chart book: Putting a Face on America’s Tax Returns. So, to answer the question in the title, whether or not most people end up paying income tax depends entirely on tax policy.